Meanwhile, in a bowl, mix together 50g Waitrose Cooks' Ingredients Breadcrumbs, ½ x 20g pack fresh mint, chopped, 2 cloves garlic, crushed, and the finely grated zest and juice of 1 lemon. Season generously with coarsely grated black pepper. 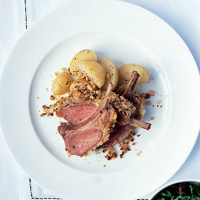 Smear 1 tsp Waitrose Cooks' Ingredients Dijon Mustard over the layer of fat, then press the crumb mixture evenly on top. Roast in the preheated oven for 25 minutes for medium (or 35 minutes for well done). Slice into cutlets and serve immediately with green salad and boiled baby potatoes.